Sheffield United returned to take part in the 1st Round of the FA Cup for the first time in 14 seasons on Saturday. Familiar faces were amongst the visitors, with Oxford United managed by former Blades full back Chris Wilder and legendary Blades keeper Alan Hodgkinson also on the U's coaching staff. It is fair to say that, apart from the return of two Lane favourites, the draw did little to encourage a disgruntled Bramall Lane faithful to come down. With prices of £10 adults and £3 concessions, a crowd of just under 8,000 must be seen as a disappointment. Especially with a healthy Oxford contingent of around 1,500 to 1,800. 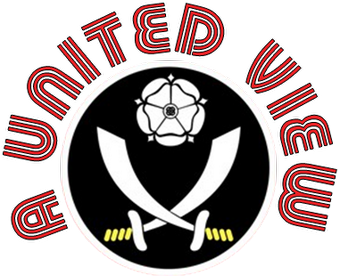 Following the success of similar articles last season, it is a pleasure to welcome Matt Bruce, Editor of Oxford United blog "The Boys From Up The Hill" to offer a view on the the match and the Blades from an Oxford persective, whilst I cast an eye over the U's performance and a comfortable victory for the Blades. Despite pre-match optimism, Oxford were incapable of making the match a contest. Chris Wilder appeared to have done his old club a favour with his baffling team selection, leaving talismanic striker James Constable on the bench and choosing to play right back Andy Whing in central defence, leaving centre back Harry Worley on the sidelines.In doing so, he further weakened an Oxford side that has been left decimated by injuries and suspension. A weak team selection was compounded further by the decision to change from the usual 4-3-3 infavour of an unfamiliar 4-4-2 formation, and a feeling of dread was hanging over the away end before the match had kicked off. Oxford fans were right to be worried and Sheffield United dominated the match, and the early stages in particular. I was surprised by how direct the Blades were, and it was disheartening to see Oxford's makeshift defence thrown into chaos by the simple ball over the top or into the channels. Cresswell and Evans proved too much to handle and picked their way through the defence with ease. Oxford, usually comfortable when in possession of the ball, were way too prone to silly mistakes and squandered possession cheaply, which usually resulted in the ball being pumped back up field for more pressure on the Oxford goal. The match became more competitive after the half time changes (the aforementioned Constable and Worley taking their rightful paces on the pitch) and for a brief while it looked like we would get back into the game. But Sheffield United were very effective at slowing the match down, and after the substitution of our playmaker, Peter Leven, any Oxford threat was over, the match fizzled out and it was no real surprise when the third went in. It was a strange atmosphere; with an empty Kop end and the ground only a quarter full it almost felt like a pre-season friendly. The only time the noise levels in the ground rose above this was when fans began trading insults across the divide. The turgid football on display didn't exactly help matters and it felt that any noise from the fans was created was in spite of events on the pitch, rather than because of them. Sheffield United weren't pretty to watch but they got the job done, which must have come as a relief to Blades fans after defeat to Bradford in the JPT. The Oxford midfield was given very little time on the ball as Sheffield pressed effectively and were tenacious in the tackle. In a match as uncompetitive as this one it is difficult to judge the Sheffield United side, but it seems difficult to believe they conceded four at home to Exeter, because the defence looked assured and were rarely troubled this time around. It was sad that the match was spoiled by Wilder's baffling decisions and the Blades fans that turned up today will have left with a low opinion of Wilder's Oxford, which is a shame as they are usually so much better than that. The overwhelming emotion in the Oxford camp is disappointment – not particularly with the defeat, but with the nature of it. Sheffield United barely had to get out of second gear and were by far the better side. I arrived at Bramall Lane expecting a very tight game and went home surprised at how little competition Oxford supplied for much of the match, content with the result and a little disappointed with aspects of United's performance. In a match devoid of any atmosphere apart from the unswerving support of Oxford's fans, it was a very strange afternoon. Sat in John Street I was amazed at the number of fans around me who failed to get to their feet when we scored. Apathy rules at Bramall Lane at the minute and that appeared to stretch to our top wage earner pre-match. After the teams had come out, all of United's players went through a number of shuttle runs and warm-ups, with two exceptions. Goalkeeper Steve Simonsen I could understand, but Ched Evans? It appears, with the benefit of hindsight, he didn't need it. Whereas central defenders Andrew Whing and Jake Wright could cope manfully with Richard Cresswell, they struggled to cope with the movement of Evans. He led the line well and was United's biggest attacking threat, linking to good effect with Quinn and Williamson in the wide positions. He could have had a hat-trick within the first 25 minutes, but for a borderline offside decision. Despite conceding two goals, U's keeper Clarke had a great half, keeping Williamson and Evans amongst others at bay. Whilst they struggled a bit at the back, they had great difficulty making progress further forward. Peter Leven, who I expected to offer an outlet, was quiet and ex-Owl Paul McLaren was keen to get on the ball but offered little impetus from his passing until he was eventualy substitued. In fact the central midfield was a mess, with ball retention from both sides non-existent. Poor first touches and mis-placed passes ruled. Matt's comment regarding United pressing effectively is interesting. I was disappointed in Danny Wilson's team selection; Michael Doyle selected in a workman-like midfield alongside Nick Montgomery. Kevin McDonald seemingly being punished for not maintaining his man of the 1st half performance against Bradford, whilst Doyle was awful throughout. McDonald would have had a field day on Saturday. Up front I was surprised to see James Constable not selected, I assumed a fitness issue. Even the Blades programme had selected him as the Oxford star man. Middlesboro loanee Franks was barely noticable and Dean Smalley was kept well in check by Harry Maguire. Smalley's ineffectiveness was surprising. Chesterfield fans were keen to see him stay at the B2Net after his loan spell last season and I can only assume Oxford offered decent wages to attract him. With one JPT goal to his name I am guessing Chesterfield, despite their problems, got the better part of the deal. With such a poor first half performance, where it could have easily been three or four nil , it was no surprise to see Wilder change things. The freeing up of right back Batt into a more advanced role and the introduction of Constable were key to Oxford having their best spell of the game, but apart from a header saved by Simonsen I didn't feel they offered a threat for the increased amounts of possession. Constable offered a more physical battle, maybe too physical at times, and it was a good test for Maguire. It would have been interesting to see how well Oxford would have performed if he had been on from the start. The rare times Batt got forward in the first half, you sensed the expectation level rising amongst the away support and he certainly gave Marcus Williams problems in the second half. In fact if Oxford had really got at United's full backs from the start they may have had more joy. In the end it was a bad decision from the otherwise imressive keeper that gifted the Blades a third and that really was game over. Oxford continued to try and press, but despite the obligatory (self-inflicted) hairy moment, which is par for the course watching the Blades these days it was a comfortable final period. In writing a piece about Wilder's time at Bramall Lane for The Boys From Up The Hill I referred to the fact that many Blades fans considered Wilder a potential Blades manager of the future. He did little to state his case at Bramall Lane. He perhaps should be given credit for recognising it wasn't working and making the changes, but by then it was all over and from what Matt says it was only reverting to their usual formation anyway. Wilder made the decision to change shape before the match and it didn't work. I am sure Oxford are better than that performance, I know we are, and I wish we could be more clinical when dominating games like this. The Oxford fans sung we'll play you next year, I genuinely hope they are promoted, but also hope we aren't playing them. Hopefully a clean sheet and three goals can help jump start our stalling season.